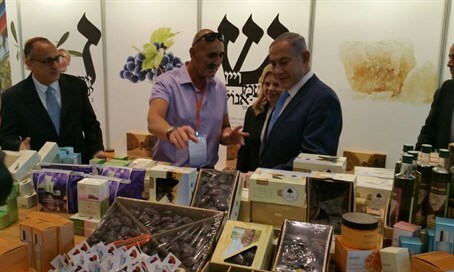 As PM visits, Yesha Council holds pavilion of local goods in Moscow for first time; Minister Erdan lauds victory over BDS. A delegation of the Yesha Council in Judea and Samaria has arrived in Moscow for the first time, in a joint project with the Strategic Affairs Ministry to present produce from the Biblical heartland of Israel to Russian consumers. Prime Minister Binyamin Netanyahu, who arrived with his wife Sarah Netanyahu in Moscow on Monday night, attended the opening of the "Opening Doors to Israel" project in Moscow, which included produce from Judea and Samaria brought by the delegation. The Yesha Council delegation included Jordan Valley regional council head David Elhayani, Megilot regional council head Aryeh Cohen, Yesha Council director-general Shilo Adler, and Yesha Council deputy director-general Yigal Dilmoni. Together with Hannah Hacohen, project director at the Strategic Affairs Ministry, the delegation established a large pavilion with hundreds of products from Judea and Samaria. The goods included medjool dates from the Jordan Valley, olive oil from Meshek Achiya and the Jordan Valley, products from the Ahava factory on the Dead Sea, honey from the Jordan Valley, contoured maps of Israel, selected wines from Judea and Samaria wineries, and more. Some of Israel's finest produce was presented in the pavilion under the tag "Made in Israel" to the wider Russian public, the Russian press and decision makers in Moscow. The pavilion was opened on Monday to the attendance of roughly 3,000 people and dozens of Russian journalists. Thousands of medjool dates were distributed for tasting, and likewise contoured maps and Ahava cosmetics samplers were also handed out. Yesha Council official Shilo Adler said that "the goal of the fair is to expose the excellent products of the state of Israel, and in particular from Judea, Samaria and the Jordan Valley, which combines an historic region with an ancient tradition together with the most advanced technology that is producing high-quality products and agriculture." "Likewise the economic and technological development in Israel contributes to the entire region of the Middle East - farmers from the whole region come to learn from us, and make a living off of the Israeli success," added Adler. Strategic Affairs Minister Gilad Erdan (Likud) congratulated the Yesh Council over the exhibit. "Particularly in these days, when the state of Israel is dealing in a campaign against the boycott movement, a great exposure of products from Israel to new markets and audiences strengthens the state and harms the intentions of boycott activists to harm the economy of Israel," said Erdan. "In just the last year the foreign investments in Israel grew by dozens of percentiles at a time when the boycott organizations tried to cause the oppose trend of pulling investments from Israel." "We will continue to act in quiet and wisdom against the organizations that try to harm the state of Israel," concluded the minister.